Dinie's Tangled Threads: Sorbetto shirts. What began as just sewing has now morphed into a Homesteading and self-sufficient blog outlet. Moving to a new state, starting our homestead and trying to do what we can to keep ourselves healthy and saving money. "Use it up, Wear it out or Do without." Is the motto here. I look forward to growing and learning. Come along with me! I feel like I'm always late to the sewing party. I'm making some Sorbetto tops. The pattern is free from Colette, one of my favorite pattern companies. I love their classic style and lady like patterns. They actually help you learn so that you can sew more! What an awesome service to people who want to sew. If you get frustrated with it you might quit. I'm making a regular Sorbetto in a pink flower print, but I'm adding sleeves to it. I'm also working on a black linen version. 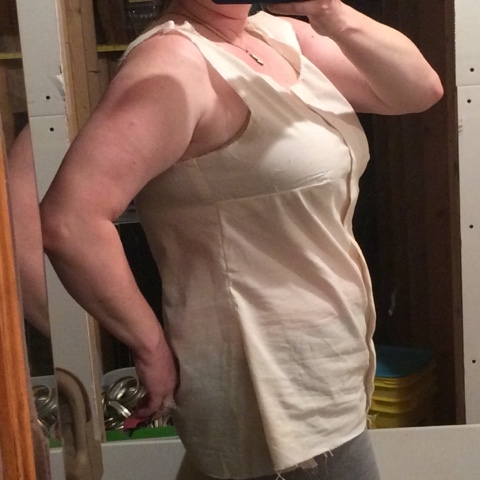 I'm thinking of inverting the pleat or removing it all together so I can have a clean black tank as a layering piece. 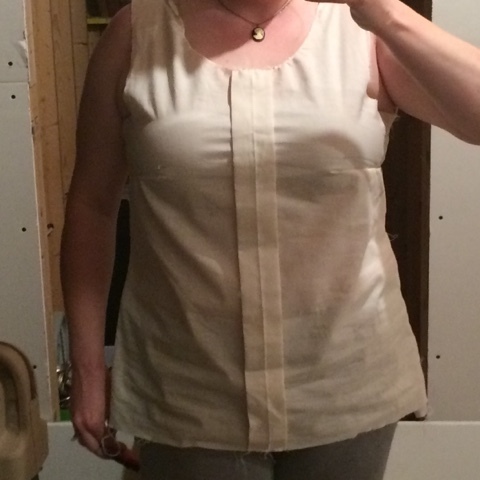 I might make one in white too without the pleat as I always need a nice comfy tank to wear. What better than a custom fitted one that you made yourself? It's not a show piece, but everything can't always be amazing. Also, I've found that people are just amazed if you wear anything that you didn't go to the store and make. When did that happen to our society? I Digress. This is my first muslin. I didn't like the large opening that it gave for the armholes in the size I used. I ended up sizing down and doing a larger FBA than normal to get the sleeve opening comfortable. Every blog I read about the tops said that they thought they were too short so I added length to them (quite a lot actually!) There is a hack for making this into a dress as well, but I don't think it would look too great on my body shape. More updates and pictures to come as I straighten out the fit and whip a few of these up. Download 'Sorbetto' here and make your own. I'd love to see your creations. There are so many people on the Sorbetto kick. Some have made changes to this basic pattern and made some amazingly beautiful things. Even if you make it as written it's a fun and easy pattern to make. There is also a link to show you how to make your own bias tape!! A zero waste sewing win!! I am a full time homesteader (and hopefully soon-mother) and weekend sewing enthusiast. I also like to grow heirloom vegetables and manage my household. In March 2014 we became proud owners of 10 acres that I am working on to become our perfect homestead. I love vintage clothing and obviously homesteading so most of my posts will be related to that. VINTAGE or reproduction patterns and mostly new fabrics. Vintage fabrics are pretty expensive. I'd love to do some more recycled or upcycled clothing as well. I like making costumes. I'm going to be posting some of my finished costumes, but I'll have to find the pictures. If you found me though google+ I appreciate you stopping in. Leave a comment so I know you were here. Brute Force Studios - The source for your Victorian and Steampunk needs! Made by Dinie. Awesome Inc. theme. Powered by Blogger.